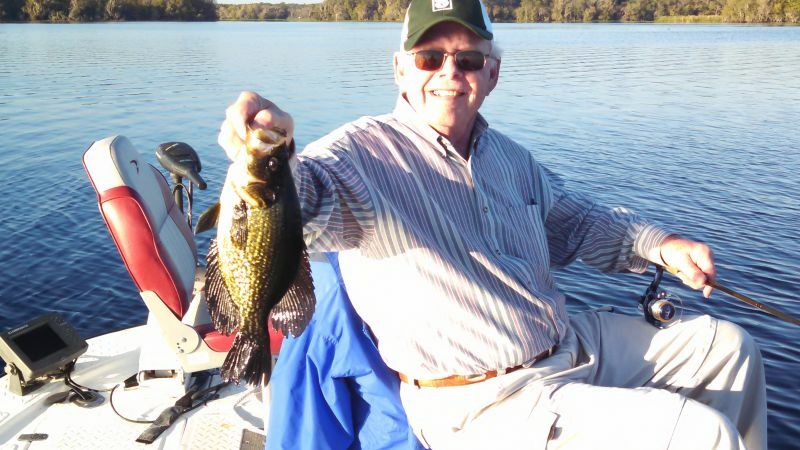 Hi, this is Captain Steve with a fishing report from the St Johns River. I guided Phillip and Becky from North Carolina on a Crappie fishing trip. I started the day by picking them up at Parramores Fishing Camp and Campground on the St Johns River. We ran down to Lake Dexter to fish, after we got set up and started catching a few Crappie then Becky mentioned she wanted to see a manatee. While I was thinking of where I could take her to see one, we noticed about twenty to thirty yards from the boat one was swimming and watching us, we eased over and got a couple of good pictures for Becky. She also wanted to see a few Alligators as it was her first time down to Florida, so off we went on a nice site seeing tour…I like a plan that comes together, whether it by mistake or not..lol. They told me at the end of the trip, they had a great time catching fish, wildlife watching and seeing all the great scenery here in Florida.